If you're one of Evanescence's most devoted fans, perhaps you've been singing 'Bring Me To….Live!!! Yes, you read it right. Evanescence is all geared up to bring their ever amazing repertoire onto the live stage once more, this time, returning to the rock-band mode. They're set to pack a wallop with their ethereal, goth rock sound as embark on this latest North American tour. This tour de force will take them around top-tier venues in key cities and states. 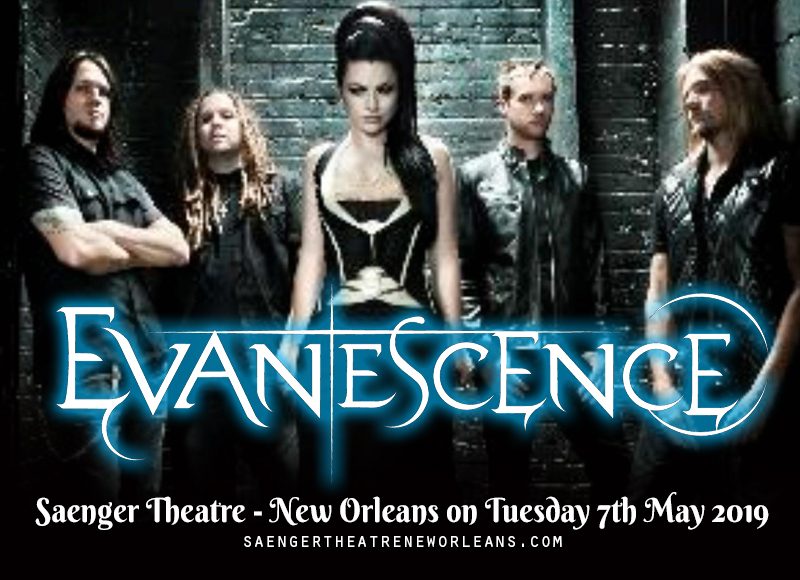 One of their most exciting stops will happen here at the Saenger Theatre – New Orleans on Tuesday 7th May 2019. Evanescence fans will definitely not let this momentous comeback pass them by. As soon as the band announced their headlining tour, trending topics, hashtags, comments, reacts, and shares were flooding in all corners of social media sites. The ticket buying frenzy has begun as well. Get in on the action and book your tickets now! Still reeling from their Synthesis tour last year, which was warmly received by their fans and has gotten glowing reviews from the press, Evanescence now returns to the live concert stage with their signature goth-rock-metal sound. Evanescence has been rocking the scene since 1995, and it all started when frontwoman/lead singer Amy Lee and guitarist Ben Moody started writing and recording songs. They recruited other band members to complete the line-up; then they released a succession of EPs and the debut album “Origin” in 2000. Yet it was in 2003 when the release of the album "Fallen" became pivotal to Evanescence's breakout success. The album debuted at number 7 on Billboard and climbed all the way up to number 3, and clinging tightly on the top ten position for a whopping 43 weeks straight. Chart action, massive airplay, and an ever-increasing fan base raked-in colossal album sales reaching certified seven times platinum mark. This impressive feat is hugely attributed to the intense and fervor reaction of fans towards their earth-shattering hits "My Immortal" and "Bring Me to Life". And as if these were not enough, Evanescence received five Grammy nominations and took home two Grammy Awards for Best New Artist and Best Hard Rock Performance for their smash hit "Bring Me to Life." In no time, the band was transformed into a touring machine that brought them all around the world, hailed as superstars, and after two decades, Evanescence is still at the top of their game.